Electrify America to Add 160 Fast Chargers in Calif. This is part of the organization’s Cycle 1 California ZEV Investment Plan, where it is developing a network of electric vehicle charging stations along highways and in six California metropolitan areas which include Fresno, Los Angeles, Sacramento, San Diego, San Francisco and San Jose. Electrify America has begun its plan to install 160 DC fast charging stations in California by next June, and has chosen a shopping plaza in Torrance as the first location. This is part of the organization’s Cycle 1 California ZEV Investment Plan, where it is developing a network of electric vehicle charging stations along highways and in six California metropolitan areas which include Fresno, Los Angeles, Sacramento, San Diego, San Francisco and San Jose, according to release from Electrify America. The fast chargers have the capability to charge an EV up to 20 miles of range a minute to a vehicle, according to a release from the company. The planned network in the state will consist of more than 600 DC fast charging dispensers at the station sites. Future Electrify America DC fast charging stations in California will also be located in Montebello; Elk Grove; Novato; Livermore; Madera; Sacramento; La Mirada; and Dunnigan. The locator map can be found on the company’s website or by clicking here. 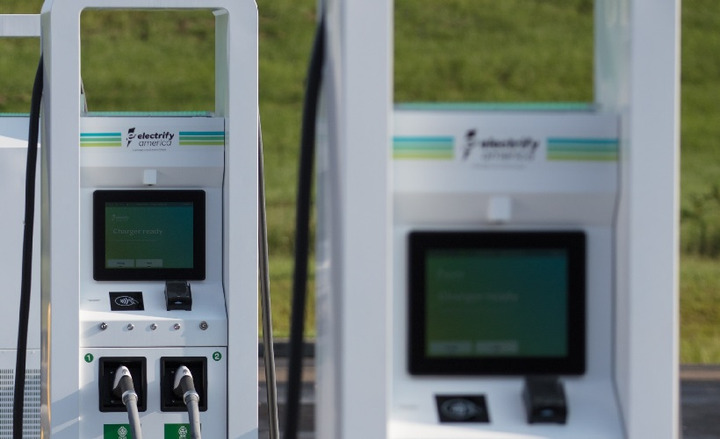 Electrify America’s nationwide DC fast charging stations will be located along high-traffic corridors in 42 states, including two cross-country routes. Locations will accommodate between four and ten chargers, with charging power levels up to 350kW available, capable of adding up to 20 miles of range per minute to a vehicle.